Oakland based Brett Amory traveled to London for a solo show at The Outsiders Gallery entitled Intentional Abstractions which opened on Jan 13th. He guest blogs up his time in London with a special trip into the bowls of Lazarides for a peek at thier intense collection. 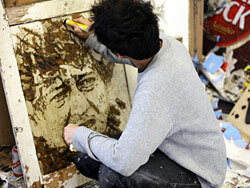 The first UK solo show from Vhils, AKA Alexandre Farto (b.198X), features a series of new works inspired by his native city of Lisbon at a time of revolution.